British High Commissioner to TT Tim Stew. 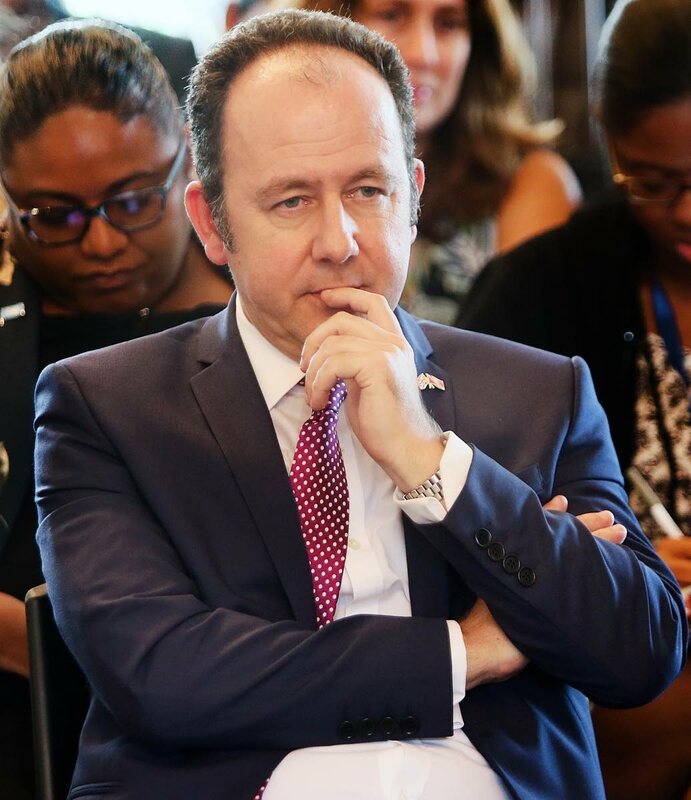 THE appointments of Stuart Young as Minister of National Security and Gary Griffith as Police Commissioner received a seeming endorsement from British High Commissioner Tim Stew, in remarks at a talk on human trafficking last week Friday. The event, hosted by the NGC Bocas LitFest, British and American missions, UNTT, and the Caribbean Umbrella Body for Restorative Behaviour (CURB) was held at Bocas' Writers' Centre in Alcazar Street, Port of Spain, ahead of a screening of the movie Moving Parts later that day. Stew described the two appointments as “significant developments.” He said, “I’ve seen the range of reactions, from the positive to the abstentions, the criticisms and the cynicisms. On human trafficking, Stew said the British government had introduced the Modern Slavery Act in 2015, with penalties from 14 years to life imprisonment. It also launched a Call to Action to end Forced Labour, Modern Slavery and Human Trafficking, which 70 countries have supported. This policy paper was sent to the UN in September 2017 and urged support for treaties, domestic legislation, local law enforcement and international co-operation to curb modern slavery and support victims. Stew said next month the Call to Action will be put on an internet platform to show which countries have endorsed it and what they have done to implement it. Calling human trafficking “an evil crime,” Stew said it has 40 million victims globally and generates US$150 billion per year in illegal profit, exceeding the entire US financial sector. He said modern slavery/human-trafficking is a significant global problem that cuts across human rights, security and corruption. “Women and girls account for over 70 per cent of victims of this cruel problem,” he pointed out, and a quarter are children. Reply to "Commissioner Stew backs Gary, Young"